A sandstorm in Syria near the Euphrates river valley provided cover for an ISIS counterattack in mid-October. In battles between October 8 and 15 ISIS was able to kill a number of Syrian Democratic Forces members and also capture d at least one MaxxPro MRAP. Early reports on October 11 showed smoke rising in the distance near the Euphrates in the aftermath of the clashes. Later it became clear a series of engagements along the front from Baghuz to north of Hajin was part of a chaotic series of battles that unfolded. ISIS had used a sandstorm to screen its movements. Gabriel Chaim, a photojournalist, wrote on October 17 “the night become hell, the true silent hell on earth,” showing a photo of an SDF position opposite ISIS. 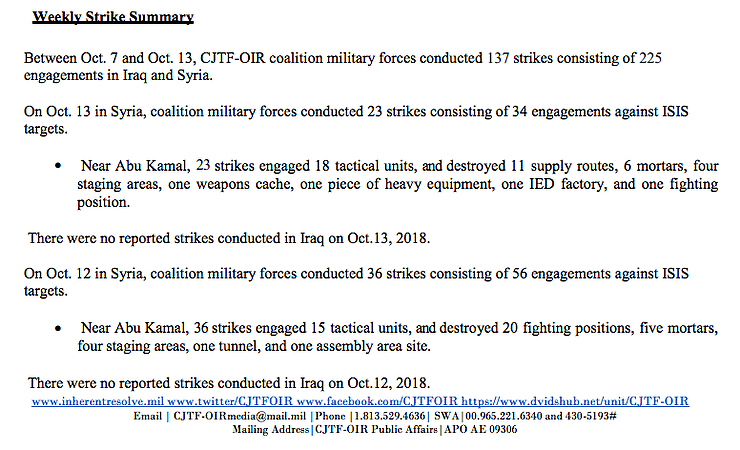 I emailed the US-led Coalition on October 14 and received the following response. “I can confirm ISIS did counterattack the SDF and both parties were fighting during a sandstorm as it is a desert area. Both forces attack and counter attack as that is part of the on-going fighting, but anyone inferring one party has an advantage on the ground during a sandstorm is not militarily correct. The number of SDF killed has been greatly exaggerated as usual from this enemy that feeds off dis-information, and SDF media official Mustefa Bali has already denied any of its fighters had been captured, so no reason for the Coalition to believe otherwise. We have never stated the enemy has lost their will to fight and that makes them dangerous, nor do we underestimate our enemies. The goal is the same for the Coalition and partners, to remain until the enduring defeat of ISIS. I have not seen two large up armored vehicles at this time, so I cannot confirm nor deny that one.” , Sean Ryan, Colonel, U.S. Army, Spokesman, Operation Inherent Resolve, wrote. 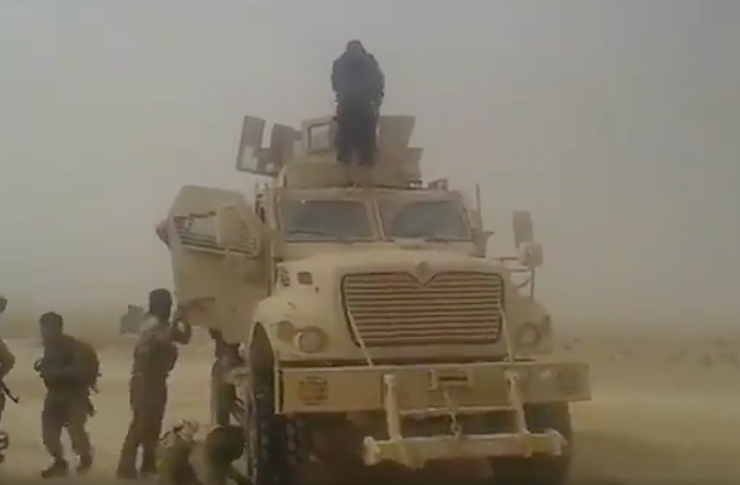 ISIS had put out a video of their fighters with the MRAP in the desert. The video and accompanying photos show at least half a dozen trucks and a dozen motorcycles used by ISIS in the attack. Of particular interest there were also at least two large uparmoured vehicles in the video as well. ISIS has used uparmoured vehicles throughout its wars in Syria and Iraq. Many of these vehicles were destroyed in battle, often packed with explosives and designed to be suicide truck bombs. 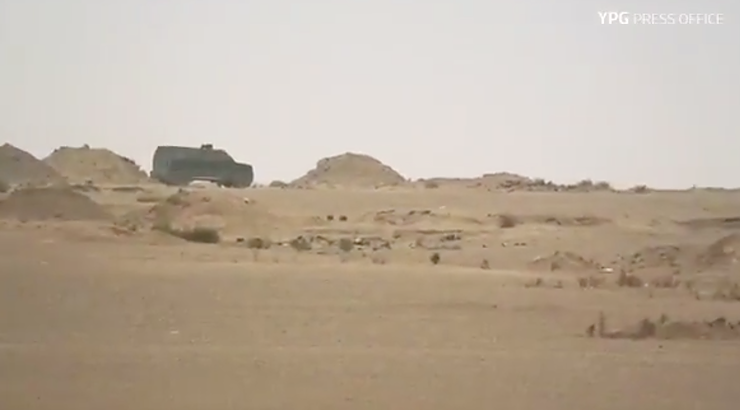 However it appears here that these APCs survived the battle and melted back into the terrain along the Euphrates where ISIS has been able to maintain a presence. ISIS also put on a parade near Hajin after the battle. They also posted video of dead bodies from the battle and what appeared to be captured men. However on social media supporters of the SDF and the YPG put out videos seeking to counter ISIS claims of achieving a victory. One photo from October 12 appeared to show a jeep from the ISIS video subsequently destroyed. A third video showed a woman from the YPJ and claims that the attack near Baghuz had been “repelled.” A press release f rom the SDF claimed that on the axis front of “Al-Bagous, AL- Bahra, and Hajin” the battles had resulted in 34 ISIS killed and 3 car bombs destroyed. They also claimed to have captured several ISIS members. They also posted insignia of the different units involved in the battle, including members of the Syriac Military Council. During the battle ISIS was also accused of abducting women and children from an IDP camp near Hajin. The Independent reported “The captives were among some 250 civilians taken from the al-Bahra displacement camp, near the town of Hajin, after Isis fighters stormed the area on Friday and forced Kurdish fighters to flee, according to a war monitor.” An SDF statement also noted the attack. ” The SDF Press Center said in a statement that “the mercenaries active in the area, taking advantage of the dust storm, and infiltrated into Hajan refugee camp next to Al Bahra town. In parallel with moving their dormant cells inside the camp, they targeted the civilians directly, while the SDF confronted and engaged them to protect the displaced people from the fire opened by terrorists”. The estimates of those abducted ranged from 130 “families” to 700 total. The battle in Hajin came just after the Coalition had invited reporters to see the progress of the operation. DW produced a video from the trip on October 11. Video from the same day showed SDF reinforcements arriving . “These are our lands and we will liberate them from the abomination of the mercenaries.” In the leadup to the battles a French foreign volunteer named Şahin Qereçox (Farid Medjahed) with the YPG had been killed on October 6. A full list of the strike updates can be found here . Nevertheless, despite this air campaign, ISIS fielded dozens of vehicular units out in the open, using the sand storm as cover. ISIS has also held up the SDF offensive since early August when this “final stage” of operation roundup was launched.